At Discovery College, all teachers support the development of aspects of PSPE. 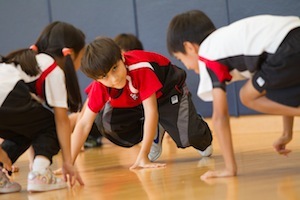 All primary students engage in physical education for two learning sessions a week. Physical education teachers work collaboratively with class teachers in developing transdisciplinary units where appropriate. In addition to the class sessions, the college offers a range of team and individual sporting activities and primary events, such as athletics and swimming, where students participate in their College House. Through the programme of inquiry and pastoral care, teachers support the development of social and personal education. Discovery College is committed to the implementation of Restorative Practices. Through Restorative Practices we seek to enhance relationships among students, and between students, teachers, and parents, so as to nurture our sense of community at Discovery College. A positive school climate, in which young people feel connected, is the best environment for learning. The College provides the support of a counselor who works with teachers, students and families to support well-being.